Command Outdoor Medium and Large Foam Refill Strips are specially designed to hold strongly outdoors and are water and UV resistant. Command Hooks are easy to apply and remove, without damaging surfaces with holes or sticky residue. Medium and Large Outdoor Foam Refill Strips, 17615AW-EF Command Outdoor Medium and Large Foam Refill Strips are specially designed to hold strongly outdoors and are water and UV resistant. 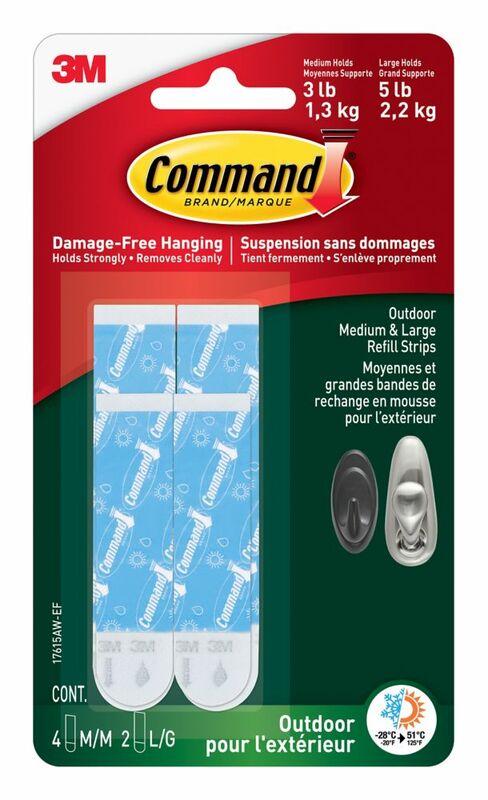 Command Hooks are easy to apply and remove, without damaging surfaces with holes or sticky residue. Medium and Large Outdoor Foam Refill Strips, 17615AW-EF is rated 5.0 out of 5 by 6. Rated 5 out of 5 by doee from Easy to install on the exterior window to hang a 4+ lb. Christmas greenery with lighting! It rea... Easy to install on the exterior window to hang a 4+ lb. Christmas greenery with lighting! It really works! All the windows have the same Outdoor Command Blue Strips and ALL the Christmas Greenery is still on the windows; even during a 50 mph windstorm this past weekend! Thank you for inventing this new item. Rated 5 out of 5 by pabg from large outdoor hooks Used on our wooden Church doors at Christmas. Wind is terrible where we are located. Held throughout the Christmas season and no residue on our beautiful wooden doors.